ForPlay® Succulents® are a warming, flavored, personal lubricants with an assortment of delicious, sugar-free flavors. Succulents®, respond to touch & breath by creating a light warm sensual feeling when rubbed or blown on. It’s long lasting lubricity will add to your fun & sensual pleasures. See Product Description for more details. 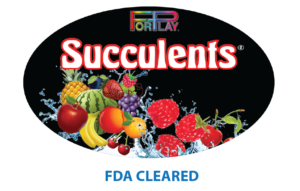 ForPlay® Succulents® are a warming, flavored, personal lubricants with an assortment of delicious, sugar-free flavors. Succulents® are delicious all natural lubricants, respond to touch and breath by creating a light warm sensual feeling when rubbed or blown on. It’s long lasting lubricity will add to your fun and sensual pleasures. Ingredients: Purified Water (Aqua), Propylene Glycol, Hydroxyethyl Cellulose, Glycerin, Sodium Benzoate, Potassium Sorbate, Citric Acid, Raspberry Flavor. Available in: 5 luscious flavors in 2.2 oz tubes Wild Strawberry, Cherries Jubilee, Absolute Raspberry, Kool Watermelon, Juicy Fruit.